The inflation shall take place on a slope between 10 % and 33 %. It shall be carried out in headwinds of less than 8 km/h (measured about 1,5 m above the ground) and shall be repeated twice (to ensure the genuine behaviour is established). The test pilot uses a normal forward launch technique (controls and A-risers in the hands, the other risers in the elbows, A-lines just tight, constant steady acceleration). If a special take off technique is required for a paraglider then this information shall be contained in the users manual, and the test pilot shall follow these instructions. The pilot shall make a normal landing (straight final glide at trim speed) on level ground, into a wind of less than 8 km/h (measured about 1,5 m above the ground), using the controls only. If a special landing technique is required for a paraglider then this information shall be contained in the users manual, and the test pilot shall follow these instructions. Assess the trim speed in 10 s stabilised straight flight and then the minimum speed in 10 s stabilised straight flight. Check the zero position and the symmetric stall position reference marks. The symmetric stall position is checked by stabilising the paraglider in straight flight at trim speed. Over a period of 5 s gradually lower both controls to the symmetric stall position marks, being careful not to induce pitch oscillations. 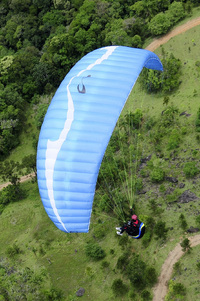 In this position the paraglider must enter a full stall within 3 seconds. Assess the control forces throughout the procedure. This test is only required for paragliders equipped with an accelerator. The paraglider should be flown on a straight course at maximum speed. The accelerator should then be released abruptly, and the behaviour of the paraglider assessed. Activate both controls symmetrically to 25 % of the symmetric control range within 2 s.
Hold that position for 2 s. Then slowly release both controls. Induce the maximum possible roll angle achievable by quickly activating and releasing each control in turn to the symmetric stall position marks once without inducing a stall, spin or collapse. The timing of the control inputs is selected by the test pilot to maximise the roll angle. Then observe the glider's immediate behaviour. Stabilise the glider in straight flight at trim speed. By use of the controls only, direct the paraglider into a gentle spiral between 3 m/s and 5 m/s sink rate, such that the least stable behaviour (least tendency to exit the turn) is established. Maintain this sink rate for one turn. Then release the controls over a period of 2 s and observe the paraglider's behaviour. If the turn clearly tightens, the pilot acts to recover the glider. Otherwise the pilot waits for two turns to establish the glider's behaviour. The pilot shall not counteract inertia effects on his body at any stage. Without using a counter-turn, and by steadily activating the inside control, quickly direct the paraglider into the steepest possible spiral dive achievable in two turns (without inducing a spin or a collapse). Measure the descent rate and document in the test protocol. Any relevant observations e.g. particularly fast acceleration of the glider, must be noted and commented on in the test protocol. Release the controls and attach them to the risers (however, for safety reasons, the controls may be kept in the hands if the front collapse is achievable without significantly affecting the trailing edge). Then by abruptly pulling the appropriate lines or risers, induce a symmetric front collapse over the entire leading edge with as little as possible, but at least 40 % of centre chord affected. As soon as the collapse is achieved, let go of the lines/risers. If the paraglider has not recovered spontaneously after 5 s or after 180° of turn (which ever happens first), the pilot acts on the controls to recover (without inducing a deliberate stall). If the return to normal flight is not easily recognisable, and visible on the video documentation (marked forward pitching or acceleration) , then the test pilot should activate one control to 50% after 3-5 seconds in order to indicate if normal flight has been restored. If the paraglider is equipped with an accelerator then the following additional test is required: Stabilise the glider in straight flight at maximum speed. Then by abruptly pulling the appropriate lines or risers, induce a symmetric front collapse over the entire leading edge. As soon as the collapse is achieved, let go of the accelerator and the lines/risers. Slow down the paraglider using the controls to obtain a trajectory as close as possible to the vertical without significantly changing the shape of the wing (deep stall). If a deep stall cannot be achieved due to a very long control travel, the pilot takes wraps to shorten the control lines. If a deep stall is achieved, maintain it for 3 s. Then release the controls smoothly and gradually (in about 2 s) to the zero position. If the glider does not recover in 5 s then intervene in accordance with the user's manual. Attain a trajectory as close as possible to the vertical (deep stall), without activating the controls or the accelerator, and with the minimum amount of deformation of the canopy (usually by using the minimum necessary pull-down of the B-risers). Maintain this exacting condition for 3 s.
Then release the risers over a 3 s period, symmetrically and continuously. Stabilise the glider in straight flight at minimum speed. Fully apply the controls and hold that position until the paraglider is in a maintained full stall. If a full stall cannot be achieved due to a very long control travel, the pilot takes wraps to shorten the control lines. Release the controls slowly and symmetrically, until the canopy has approximately regained its inflated span. Then quickly and symmetrically fully release the controls in a period of 1 s.
If an asymmetric collapse occurs, it is assumed that the release has not been sufficiently symmetrical, and the test manoeuvre should be repeated. If any pitch oscillations don't die out, the controls are to be fully released when the canopy, rocking forward, arrives above the pilot. Release the control handle on the side to be collapsed and attach it to the riser. Pull down the appropriate lines on one side as fast as possible to collapse the canopy asymmetrically at 50 % of the span at an angle of approximately 45° relative to the longitudinal axis. As soon as the collapse is achieved, release the lines quickly. The pilot shall take no further action and remains passive until the glider either recovers, or changes course by more than 360°, or 5 s elapses. If the glider has not recovered, the pilot acts to recover the glider. The test is repeated with a collapse of 70 % to 75 %. The folding line at the maximum collapse point must be within the marked tolerance area on the glider. If the paraglider is equipped with an accelerator, the whole procedure (50 %, 70 % to 75 %) shall be repeated with the accelerator fully activated. The accelerator shall be released at the same time as the lines are released. To document that the collapse was achieved within the tolerance area, video must be recorded from camera frontal course and camera rear course positions. Rear course video recordings must show that the trailing edge has been collapsed to within the tolerance area. Camera axis frontal course, rear course. Release the control handle on the side to be collapsed and attach it to the riser. Pull down the appropriate lines on one side as fast as possible to collapse the canopy asymmetrically at 50 % of the span at an angle of approximately 45° relative to the longitudinal axis and hold the collapse. Then the pilot attempts to keep course for a period of 3 s, using the control on the inflated side if necessary. From straight flight the pilot further uses this control to turn 180° to the inflated side in a period of 10 s without involuntarily entering an abnormal flight condition. The pilot assesses the position of the control relative to the symmetric stall position mark. Collapse the glider as described above. From straight flight the pilot further uses this control to establish the minimum amount of control input required to induce a stall or spin. This amount of control shall be applied in a period of 1 s.
The pilot assesses the position of the control relative to the symmetric stall position mark. Then over a period of 2 s activate one control to 25% of the symmetric control range. Wait 20 s or until the glider has turned 360°, then over a period of 2 s further activate the same control to 50 % of the remaining range, and wait 20 s or until the glider has turned another 360°, or the glider has obviously entered a spin. Stabilise the glider in straight flight at low speed. Then over a period of 2 s further activate one control to 50 % of the remaining range (i.e. to 75 % of the symmetric control travel) without releasing the other, and wait until the glider has turned 360°, or the glider has obviously entered a spin. If the glider does not turn, or turns only slowly, then the pilot should hold this position for a further 20 s.
Induce a spin with as little pitch and roll as possible by rapidly lowering one control to its maximum range whilst releasing the other. Release the inside control while the glider is above the pilot after about one turn of spin rotation, inducing as little pitch and roll as possible. This manoeuvre is not required should the manufacturer exclude it in the glider handbook, and the B-risers are explicitly marked to indicate this. Quickly pull down the B-riser maillons symmetrically until the maillons reach the main connectors, or until a mechanical limit (e.g. interference with the accelerator or other risers) is reached. Wait 5 s, then quickly and symmetrically fully release the risers in a period of not more than 1 s.
If a special technique for entry is required then this information shall be contained in the users manual, and the test pilot shall follow these instructions. This manoeuvre is not required should the manufacturer exclude it in the glider handbook, and the A-risers are explicitly marked to indicate this. Collapse approximately 30 % of the span at each tip by twisting down the appropriate lines simultaneously. Note the glider's behaviour. After at least 10 s let go of both ears simultaneously. The pilot shall take no further action and remains passive until the glider either recovers, or 5 s elapses. If the glider has not recovered spontaneously, the pilot acts to recover the glider. If the glider is equipped with special big ears handles or if special entry or exit techniques are required, then this information shall be contained in the users manual, and the test pilot shall follow these instructions. Collapse approximately 30 % of the span at each tip by twisting down the appropriate lines simultaneously. Fully apply the accelerator and note the glider's behaviour. After at least 10 s release the accelerator quickly, and immediately let go both ears simultaneously. The pilot shall take no further action and remains passive until the glider either recovers, or 5 s elapses. To evaluate the behaviour of the glider when releasing the accelerator while maintaining big ears, collapse approximately 30 % of the span at each tip by twisting down the appropriate lines simultaneously. Fully apply the accelerator. After at least 10 s release the accelerator quickly and note the glider's behaviour while maintaining the big ears. If the glider is equipped with special big ears handles or if special entry or exit techniques are required, then this information shall be contained in the users manual, and the test pilot shall follow these instructions. Stabilise the glider in straight flight at trim speed.br> By initial use of one control only, direct the paraglider into a spiral. By use of the controls the glider is accelerated until a sink rate of 14 m/s is achieved. (If 14 m/s cannot be obtained then evaluate at the highest possible sink rate). Then release the controls over a period of 2 s and observe the paraglider's behaviour. If the turn clearly tightens, the pilot acts to recover the glider. Otherwise the pilot waits for three turns to establish the glider's behaviour. The sink velocity at which the spiral stability is evaluated must be recorded in the documentation. Apply the alternative control method recommended in the users manual without affecting the primary controls and perform a 180° turn. Wait for 20 s or until the turn is completed. Check whether every other flight procedure and/or configuration described in the user's manual but not covered in tests 4.1.1. to 4.1.23, can be flown safely. This requirement may be satisfied by the manufacturer producing suitable and acceptable evidence (e.g. video).